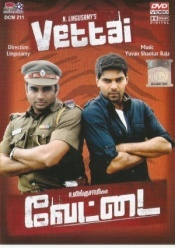 Vettai is an action-comedy-entertainer. There's hardly a speck of originality or realism here but that doesn't stop this fare from being the enjoyable entertainer that it is. Lingusamy doesn't think low of his viewers either. Sure he knows what they want but he also knows what they can process. This is regular Kollywood stuff superiorly packaged and with insurmountable energy. Gurumurthy (Arya) has just stepped in to save his brother, Thirumurthy (Madhavan) from a bully. Their father,a cop, arrives on the scene and belts him accusing him of picking a fight. Gurumurthy quietly bites the bullet and explains his philosophy in life "Never hesitate to get into a fight, especially out of fear." I flinched realizing that this message was going to reach the impressionable Tamilian. Fast forwarded to over a decade, we now have Guru and Thiru told that their father has been transferred elsewhere. It appears that the relationship they share with their father remains the same. The uneventful years are interrupted by their father's death. Gurumurthy feels obliged to join the police force. Their family has a history of cops and he doesn't want the legacy to end. But that responsibility is to be shouldered by brother Thirumurthy because he's the one with a clean record.